As of summer 2017, the Salt Lake Community College aviation program will close its doors due to budgetary constraints. While current students will be supported through completion of their program, incoming or existing students will no longer be allowed to declare or change their major to Aerospace and Aviation Technology, Professional Pilot, Aviation Business Operations, or Commercial Pilot, pending Board of Trustees approval. SLCC aviation students gathered at South City Campus on Monday to share their thoughts on the program and their educational futures. 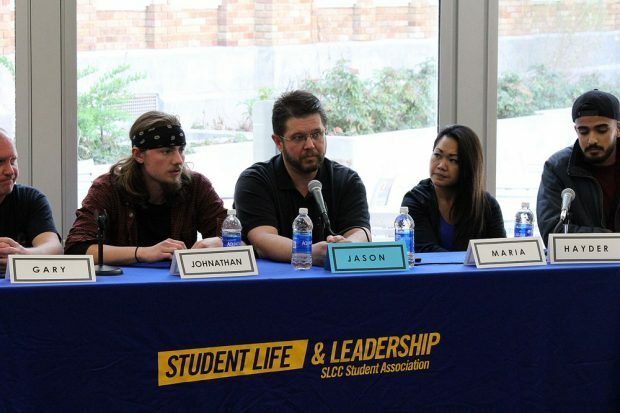 North Region Vice President, Sydney Cahoon, joined several other members of Student Life and Leadership to sponsor the Aviation Q and A on Monday in the cafeteria of South City Campus. Aviation student Maria Symond shared how she developed an interest in aviation and the wealth of resources she has found in her classes. Hayder Hussein and his classmates shared the impact the aviation program has had on them and how the discontinuation of the program will impact their careers. Many students in the program have already had multiple job offers, and the field is in such high demand that students are regularly recruited by employers while they are still finishing their degree. Student in the Aviation program answered questions ranging from their background to job prospects, and shared how they find aviation to be a lucrative and fulfilling career path. Student Life and Leadership gave out free pizza to students during the Aviation Q and A session.